Robbie Deans is a former coach of the Australian Wallabies and the most successful coach in Super Rugby history. He is the only man to be part of two tri-nations titles with two different countries. As coach of the New Zealand All Blacks he won 22 Tests, lost four, and drew one – all up a success rate of 81%. Robbie Deans coached the Australian team for more Tests than any predecessor and was the first foreign-born. He led the team to drought-breaking wins against New Zealand and South Africa. As a Super Rugby coach, Robbie Deans guided the Canterbury Crusaders to five titles, more than any other coach in history. 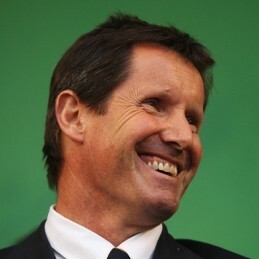 Robbie Deans was recognised as the New Zealand Coach of the Year in 2002 and named the Sir Richard Hadlee Sports Trust’s Canterbury Coach of the Year in 2001, 2003, 2005, and 2006. He was also nominated the Halberg Award Coach of the Year in 2002.